After growing tired of the standard birthday, anniversary, sympathy and "congratulations" cards, Adina Luo and Rolanda Evelyn sought to create a greeting card line that caters to "other" moments in life, that are just as important, but seldom celebrated. The "Other" cards greeting card line officially launched on March 19, 2018. 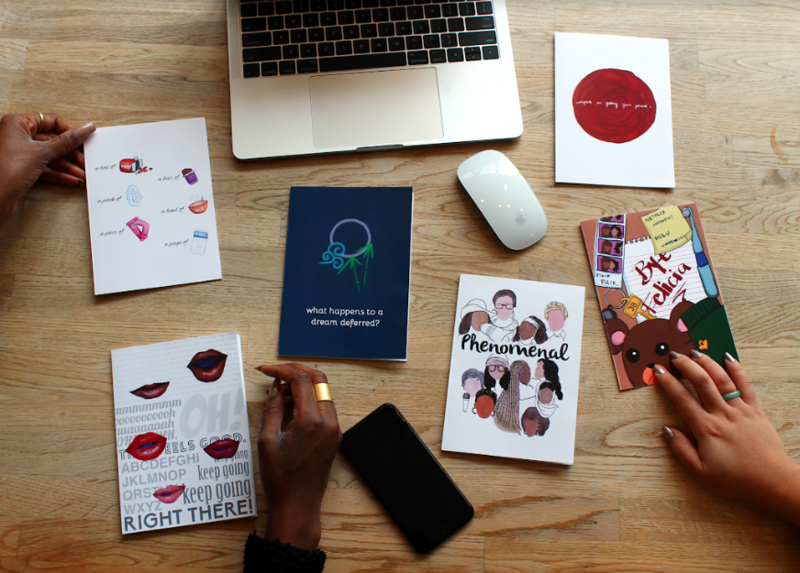 "Our cards acknowledge 'other' moments, from periods to breakups to abortions. “Other” cards is not only a project in normalization and representation, but celebration," the two co-creators said. These two young women of color have been working on this project for about six months, and have seen nothing but love and appreciation for what these cards have to offer thus far. With the firm belief that representation matters, it was important for them to provide illustrations that serve as "cultural shorthand" as common visual shorthand often caters to white culture. Evelyn noted that while in college one of her favorite courses “discussed ritual rites of passage like prom and quinceaneras." From that class, she decided to explore rites of passages that were seemingly missing from culture, among them were mentrual cycles. That's right, ladies. A card that caters to what can be the most dreadful time of the month or a joy-inducing ndicator that pregnancy has passed you by! Because it often takes years for young women to come to terms with their bodies and periods, Luo and Evelyn wanted to make a card that celebrated periods from the beginning, and that same card can be offered to a friend who could use a little pick me up during her cycle or even someone who has just dodged a pregnancy scare. This one card encompasses a whole spectrum of experiences, each of which has been ignored by the greeting card industry, but just the same deserves to be celebrated. Luo and Evelyn understand that life is life full of other rich moments that are too often stigmatized or ignored by the mainstream, frequently excluding the experiences of women, people of color, the LGBTQ community, and other marginalized groups. Some examples of cards include the "phenomenal woman" card, which honors the late Dr. Maya Angelou, and features beautiful illustrations of black women, or the Langston Hughes card, which caters to the dream-chaser who may just simply need a push to keep chasing. Currently, other cards are available only on www.forothercards.com, and the best friends hope to see the line make into stores soon. Cards are $8 each, or you can stock up on the whole collection for $42. To see the latest releases, follow @we.are.other on Instagram.